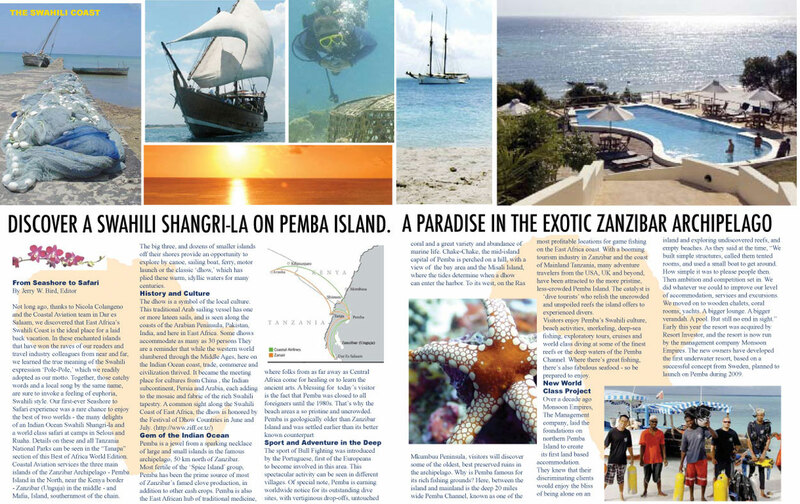 Click here for a printable 4-page section from our Tanzania , Zanaibar and Eastern Africa World Editions that includes the Pemba Story. SLEEP WITH THE FISHES! FIVE-STAR UNDERWATER HOTEL OPENS 13ft BELOW INDIAN OCEAN. It gives the phrase 'sleeping with the fishes' a whole new meaning. An unusual new room has officially opened as part of Africa's first underwater hotel has opened for business. The three floor little piece of luxury is situated 820ft from the little-known island of Pemba, off the mainland of Tanzania and Zanzibar and the room can only be reached by going down a step ladder. Located 13ft below the sea, the unique hideaway is not for the claustrophobic. The newly opened ‘Manta Underwater Room’ - 13 feet (four metres) under the India Ocean - allows travellers to observe shoals of fish drifting past during the day, watch squid and octopus at night, and perhaps even spot rarer underwater creatures lurking in the coral which is developing around the base of the room and its anchoring lines. It’s not the world's first underwater room, although it may be one of the most remote: The Manta Resort is situated on an idyllic island beach on the northern most point of one of East Africa’s finest island sanctuaries. The landing deck includes a lounge and bathroom, accessed by ladder. A small group of Swedish and Tanzanian investors made the underwater room on Pemba possible, and it is now owned by Genberg Art UW Limited. The company says the idea of the underwater room was based on probably the first of its kind, also designed by Mikael Genberg, a Swedish artist and public speaker, which opened in 2000 in Lake Mälaren in Västerås, near Stockholm. Not long ago, thanks to Nicola Colangeno and the Coastal Aviation team in Dar es Salaam, we discovered that East Africa's Swahili Coast is the ideal place for the laid back vacation of a llifetime. In these enchanted islands that have won the raves of our readers and travel industry colleagues from near and far, we learned the true meaning of the Swahili expression 'Pole-Pole,' which we readily adopted as our motto. Together, those catchy words and a local song by the same name, are sure to invoke a feeling of euphoria, Swahili style. Our first-ever Seashore to Safari experience was a rare chance to enjoy the best of two worlds - the many delights of an Indian Ocean Swahili Shangri-la and a world class safari at camps in Selous and Ruaha. Details on these and all Tanzania National Parks can be seen in the "Tanapa" section of this Best of Africa World Edition. Coastal Aviation services the three main islands of the Zanzibar Archipelago - Pemba Island in the North, near the Kenya border - Zanzibar (Unguja) in the middle - and Mafia, Island, southernmost of the chain. The big three, and dozens of smaller islands off their shores provide an opportunity to explore by canoe, sailing boat, ferry, motor launch or the classic 'dhow,' which has plied these warm, idyllic waters for many centuries. The sport of Bull Fighting was introduced by the Portuguese, first of the Europeans to become involved in this area. This spectacular activity can be seen in different villages. Of special note, Pemba is earning worldwide notice for its outstanding dive sites, with vertiginous drop-offs, untouched coral and a great variety and abundance of marine life. Chake-Chake, the mid-island capital of Pemba is perched on a hill, with a view of the bay area and the Misali Island, where the tides determine when a dhow can enter the harbor. To its west, on the Ras Mkumbuu Peninsula, visitors will discover some of the oldest, best preserved ruins in the archipelago. Why is Pemba famous for its rich fishing grounds? Here, between the island and mainland is the deep 20 miles wide Pemba Channel, known as one of the most profitable locations for game fishing on the East Africa coast. With a booming tourism industry in Zanzibar and the coast of Mainland Tanzania, many adventure travelers from the USA, UK and beyond, have been attracted to the more pristine, less-crowded Pemba Island. The catalyst is 'dive tourists' who relish the uncrowded and unspoiled reefs the island offers to experienced divers. 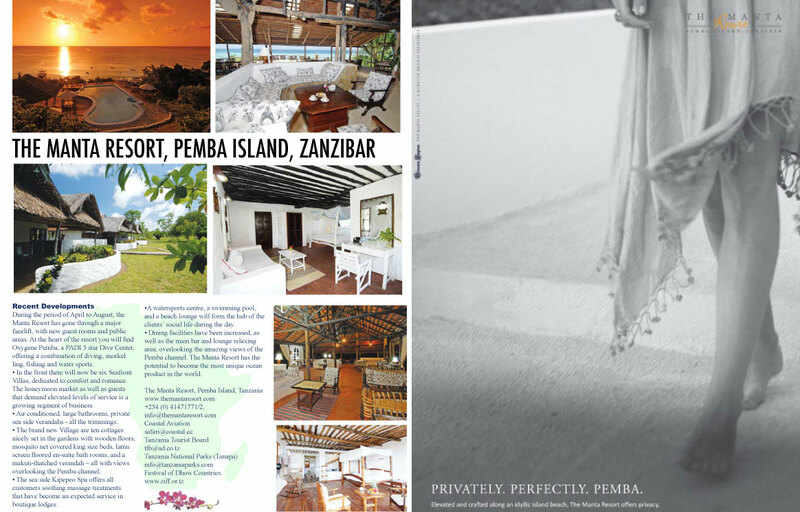 Visitors enjoy Pemba's Swahili culture, beach activities, snorkeling, deep-sea fishing, exploratory tours, cruises and world class diving at some of the finest reefs or the deep waters of the Pemba Channel. Where there's great fishing, there's also fabulous seafood - so be prepared to enjoy. Over a decade ago Monsoon Empires, The Management company, laid the foundations on northern Pemba Island to create its first land based accommodation. They knew that their discriminating clients would enjoy the bliss of being alone on an island and exploring undiscovered reefs, and empty beaches. As they said at the time, "We built simple structures, called them tented rooms, and used a small boat to get around. How simple it was to please people then. Then ambition and competition set in. We did whatever we could to improve our level of accommodation, services and excursions. We moved on to wooden chalets, coral rooms, yachts. A bigger lounge. A bigger verandah. A pool. But still no end in sight." Early this year the resort was acquired by Resort Investor, and the resort is now run by the management company Monsoon Empires. 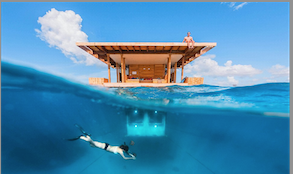 The new owners have developed the first underwater resort, based on a successful concept from Sweden, planned to launch on Pemba during 2009. During the period of April to August, the Manta Resort has gone through a major facelift, with new guest rooms and public areas. At the heart of the resort you will find Oxygene Pemba, a PADI 5 star Dive Center, offering a combination of diving, snorkel ling, fishing and water sports.  In the front there will now be six Seafront Villas, dedicated to comfort and romance. The honeymoon market as well as guests that demand elevated levels of service is a growing segment of business.  Air conditioned, large bathrooms, private sea side verandahs - all the trimmings.  The brand new Village are ten cottages nicely set in the gardens with wooden floors, mosquito net covered king size beds, lamu screen floored en-suite bath rooms, and a makuti-thatched verandah &endash; all with views overlooking the Pemba channel.  The sea side Kipepeo Spa offers all customers soothing massage treatments that have become an expected service in boutique lodges. A watersports centre, a swimming pool, and a beach lounge will form the hub of the clients' social life during the day.  Dining facilities have been increased, as well as the main bar and lounge relaxing area, overlooking the amazing views of the Pemba channel. The Manta Resort has the potential to become the most unique ocean product in the world.